Seamus P. Weir, Esq. joined Catania, Mahon, Milligram & Rider, PLLC in July of 2012 and was named partner in January of 2017. Seamus earned his bachelor’s degree from SUNY Binghamton and his J.D. degree from St. John’s University School of Law. 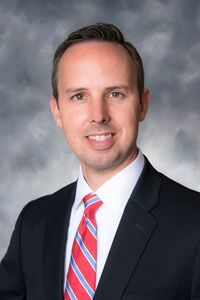 Seamus, a Goshen High School alum, returned to Orange County and joined the Orange County District Attorney’s Office in 2006. As an Assistant District Attorney, he handled cases ranging from Driving While Intoxicated to Murder. Since coming to CMMR, Seamus has focused his practice in the areas of Medical Malpractice, Commercial Litigation, Employment Law and Guardianship Proceedings. Seamus is admitted to practice in New York and is a member of the New York State and Orange County Bar Associations, as well as the Women’s Bar Association of Orange & Sullivan Counties.